The accent was what first caught my attention. The speaker was an elderly Scotsman, wearing the traditional tartan cap with a mane of wild grey locks hidden beneath. He also sported a pair of monstrous and hair riddled eyebrows that belonged somewhere in a cartoon or on an ex-Prime Minister. He and another man, who I later discovered was an English ex-pat, were discussing all things football and hoping the Town Rangers would pull back a one-goal deficit late in the second half. That never eventuated yet their conversation kept me entertained and amused throughout the final ten minutes of play. It zigged and zagged across a range of topics. The Scotsman was strong in his view that Lionel Messi was a more complete footballer than Cristiano Ronaldo and convinced that the Portuguese was overrated. He seemed quite certain that Ange Postecoglou was to blame for the Socceroos’ performance in Russia and expressed a clear view that watching women’s football was a waste of time due to the fact that they were ‘all lesbians’. I was entertained to say the least, and there was more to come. Scotsman: Do you know that fellow that plays for Sydney? Ninkovic? Scotsman: You know, the guy that plays for Sydney FC? Milos Ninkovic? Scotsman: Oh….well you should see him play. He is such a cheat. Every time someone touches him he hits the ground to win the free kick. Now, Milos Ninkovic does not need me, nor anyone, to defend his character. 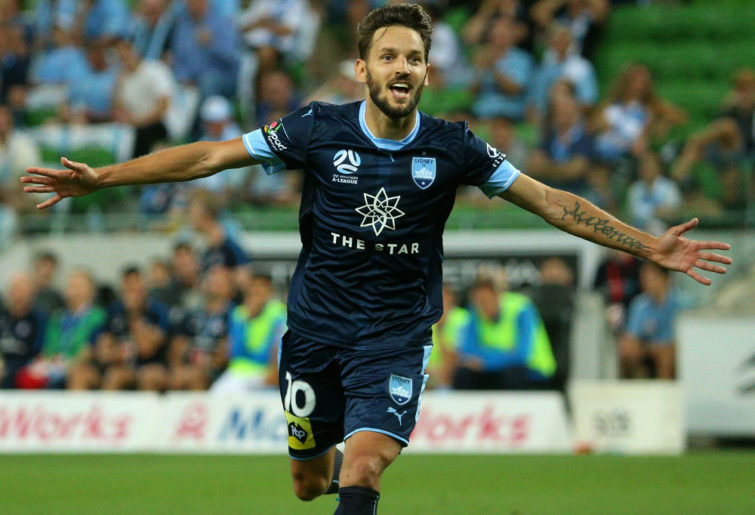 However, I had thought that general consensus saw Ninkovic as one of the classiest imports to ever grace our shores. I assumed people realised that he was one of the most closely marked players in the A-League, thus copping some rough treatment from time to time and hitting the turf regularly. Apparently not. Well certainly not, according to one fellow with a Scottish accent in western Sydney. I gave him due respect by considering his position…nah! What the exchange reminded me of, was the ever present difference of opinion in the game and the tendency for people to see it through their own lens. Josh Hope polarises Victory supporters and his inclusion in The Roar’s A-League team of the week for Round 22 came off the back of another performance that divided social media opinion. Hope’s effort on Saturday night against the Roar was somewhere between polished, classy and close to best on ground or just another frantic and clumsy effort that contributed little to the overall cause of the Victory. I sat more in the camp of the former yet there were plenty mystified by any plaudits launched in the direction of the 21-year-old Hobartian. For West Ham United fans, the enigmatic Andy Carroll has bred a similar discourse for many years. Seen either as a giraffe like impediment capable of nothing more than poaching a headed goal to keep the Irons ‘up’ or a man that offers a serious threat in the box thanks to his aerial skills, Carroll is either loved or loathed. Scoring 33 goals in 126 matches for the Hammers suggests there is a serious footballer in there somewhere, yet many would scoff at that description and often lampoon the London club for sticking with him for so long. Everyone’s favourite A-League star Matt Simon has fuelled a similar debate for a decade. Still the Mariners’ all-time leading goal scorer with 45, the ‘Wizard of Woy Woy’ occasionally pops up with the odd headed goal and for just a minute, teases people to appreciate his hustle and body work in the box. Then there are others who prefer to see the ‘Thunder from Kincumber’ as a thuggish and combative footballer, blessed with nothing more that pointy elbows and a foul mouth. Rarely is a footballing opinion universal. Managers are not immune either. Warren Joyce has had his bags packed by the City fans for some time. However Sunday’s win over Sydney was impressive, as has been their recent form, with Jamie Maclaren finally providing a focal point to the attack. Social media now identifies a few Joyce-sympathisers. Could the lynch mob be wrong? Newcastle’s Brazilian marquee Jair has lived through similar divided opinion. Appearing unfit, unfocused and ineffective early in the season, the 30 year-old has become a key component in the Jets’ revival; muting many of the criticisms of Newcastle fans. Whether it is seeing a footballer as too old, too young, playing in the wrong position or just flat out useless, opinions are formed through the individual lens that we all apply to the viewing of the game. I guess I am just lucky that my lens is spot on 100 per cent of the time. As for yours? Well I’m not so sure.